It's not unusual for our bloggers to think outside of the box, and tonight, Alison has found a great starting point with a piece of slate for her assemblage to be built upon. Watch how she applies paper-crafting principles to this unusual substrate. Hi everyone Alison (Craftytrog) here. 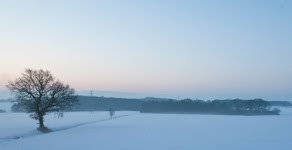 It's fab to be back here on the PA blog tonight. 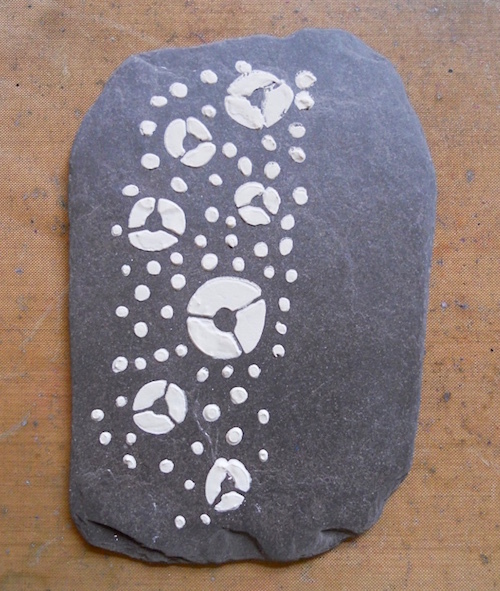 I've chosen to share with you an assemblage on a piece of slate that I found on a beach in Scotland. I was up there on holiday in April, mulling over what I could use for this post, as you do, when I found this beautiful piece of slate with its wonderful layers, and everything slid into place! When I was building the layers up, I didn't glue straight away as I wanted to find the best positioning. I found that placing the assemblage slightly to the right on the slate was the most pleasing to my eye. 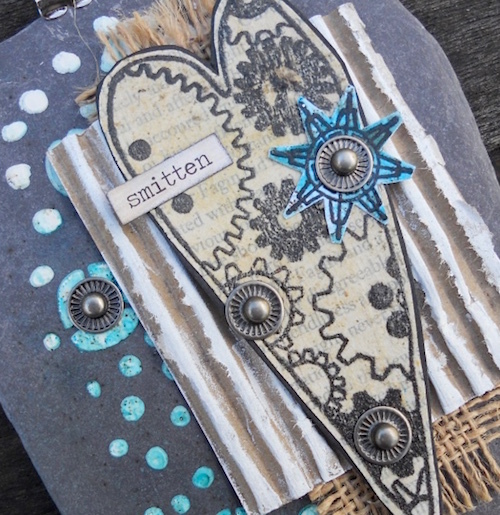 I started with a nice, easy 3D element, some Grunge Paste through PaperArtsy stencil 015. Loving the contrast with the grey of the slate! ... was stamped and embossed onto a book page that had an empty teabag glued to it. I love the colours and textures of used teabags, especially with the little specks of tea that remain. I wanted to add just a bit of colour, so I used some Infusions (A Bit Jaded-my favourite! 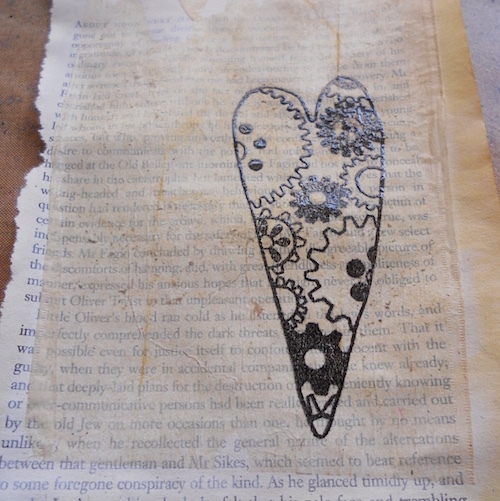 ), and also created a little stamped embellishment to carry this onto the top layer of the heart. The hessian and corrugated card just happened to be on my desk, very serendipitous. I love the different textures and layers they add. And then, all it needed was a word and some Prima Findings. I hope I've inspired you to create an assemblage of your own. If you enjoy beach-combing, and who doesn't, look out for driftwood, flat rocks, and some shells to add to your layers. Something I forgot to do was to use a wet cotton bud to remove the Infusions from between the stencilling on the slate, although it's only noticeable in my photos. It's also worth using a spray sealer if you want them to stay put too. The splash of blue infusions is perfect, and the various textures, colours and materials are fantastic. 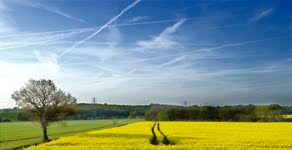 Love its simplicity, yet there are plenty of contrasts to explore too! Thanks Alison! 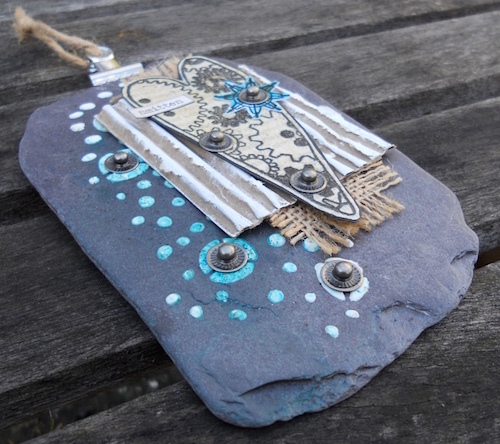 this is beautiful, Alison - love the piece of slate, what a great find. What a fabulous find Alison and just love what you did with it. It takes the "driftwood" idea to another level! 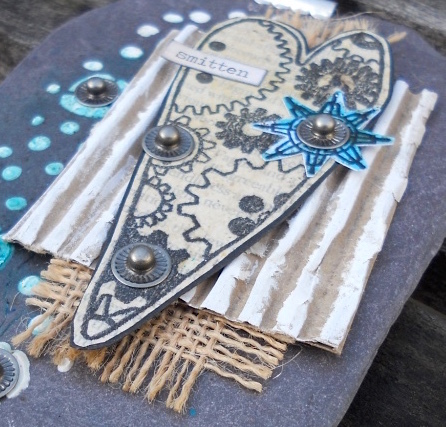 Just fantastic - from the beautiful piece of slate, to those cool press stud embellishments, echoing the stencilled texture, and such clever use of the stamps too. I love this, Alison. That is impressive. 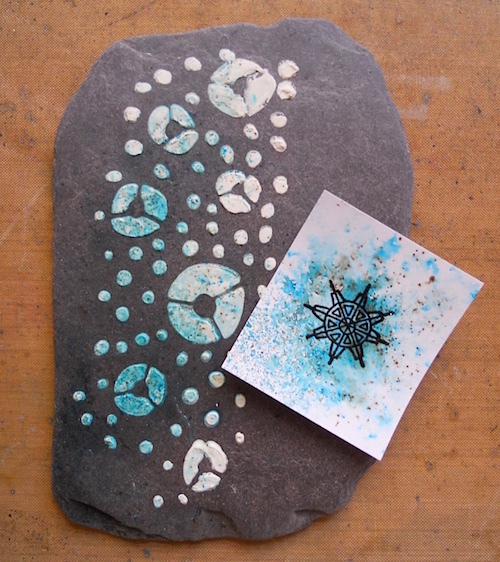 Paper crafting and slate - what a combination. Wow! 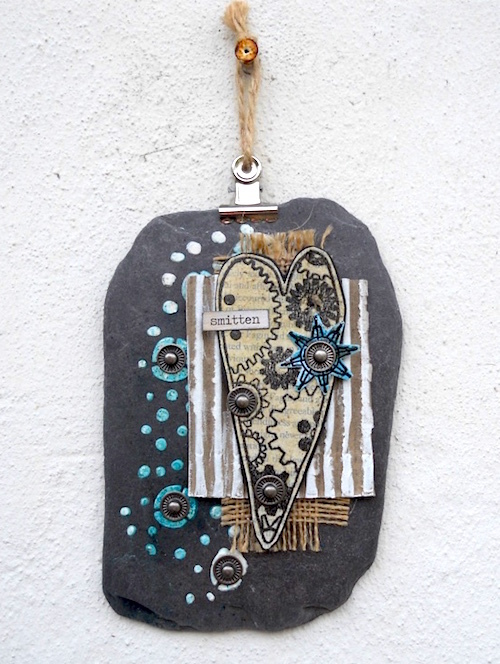 Love how you transformed your piece of slate! Such a great idea! I love projects with stones and yours is just beautiful! Wonderful creation Alison! I love slate from the colour and layers to the feel of it which to me is kind of velvety so the contrasting textures you have added to your substrate make this a very tactile creation. I love it!